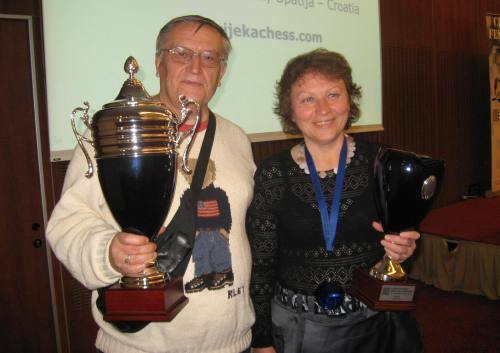 The 21st World Senior Chess Championships were held in Opatija, Croatia, from November 14th to November 27th. The Championships were organized by the Chess club “Rijeka” in agreement with Croatian Chess Federation, under the auspices of the Mountain-litoral County, the City of Rijeka and the City of Opatija. 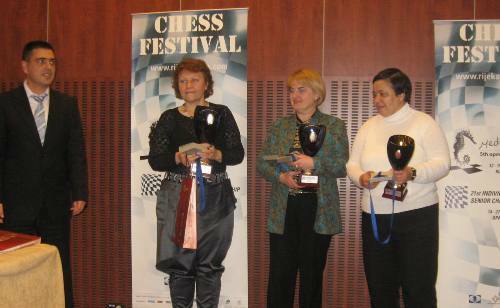 The 21st World Senior Chess Championship for men and women was open to all players representing the FIDE Chess Federations, regardless of their title or rating, providing that the male tournament participants were born in 1951 or before, and that the female tournament participants were born in 1961 or before. The title of the World Senior Champion remains in the French possession as IM Vladimir Okhotnik defeated the earlier leader GM Bojan Kurajica in the last round and took a clear first place with 9 points from eleven games. Last year champion was GM Anatoly Vaisser, also from France. According to the Championship Regulations, Okhotnik will be awarded with the Grandmaster title following the next FIDE Presidential Board. The local GM Davorin Komljenovic snatched a silver medal after edging GM Gennadij Timoscenko from Slovakia on better tie-break. Timoscenko takes the bronze medal home. Full standings bellow. In the Women Senior Championship WIM Galina Strutinskaya from Russia takes the winner’s trophy after finishing clear first with 8.5 points. Another fine result for the competitors from Georgia as WFM Nino Melashvili won a silver medal, while WGM Ludmila Saunina takes the bronze. The total prize fund was 15.000 EUR. Official website.